"Ever since I arrived at GES, the company has promoted employee recognition and has been very supportive of my own professional development goals over the years. As a manager, it is even more rewarding to see and experience the personal growth of our team members." Milena Cunningham is a Project Manager based in our Wall, New Jersey office where she is tasked with providing technical and operational leadership on multiple client projects across the region. She joined GES in 2010 and immediately accepted the challenge to take a key role in supporting one of GES’ oldest and largest national client accounts. She has not looked back since, continuing to take on more challenging assignments and responsibilities. 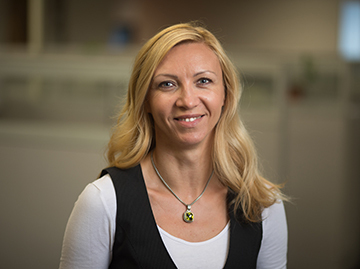 Milena has a sharp focus on quality and delivering value-driven solutions to her clients. She has enhanced these qualities by gaining hands-on experience in the field and through collaboration with her managers and other senior professionals at GES. Milena’s continued development as a leader and go-to technical resource has earned her opportunities to manage more challenging project assignments in both scale and scope. One of her recent favorites is serving as Project Manager for a preliminary assessment and site investigation at a 40-acre former chemical and research plant, which included a remedial investigation of groundwater in bedrock. Milena developed an interest in the sciences at a very early age. Growing up in Poland, her favorite school subjects were mathematics, geography, and science. It was only natural that Milena chose to study geology at Silesian University in Poland where she received her bachelor’s and master’s degrees. She also holds a New Jersey Site Remediation Professional (LSRP) license. Milena moved to the United States from Poland just after graduating college in 2003. She now lives a short distance from the office, which allows her to spend less time commuting and more quality time with her 8-year old daughter. Her favorite childhood activities included traveling and rock climbing with her father. She’s just as adventurous today, enjoying activities like running, hiking, traveling to Europe, and relaxing at the beach (of course).